Psychologists have a lot to say about our attachment to possessions. But, I wonder what they might say about thrift store purchases? I can tell you my experience. And, as an avid thrift store shopper, who is downsizing my entire home, my findings are a little disappointing. First off, I love thrift stores. I am a card-carrying member of Value Village, which is a large-chain thrift store here in Canada. This company is called “Savers” in the USA. On many occasions when we travel, I put “goodwill” or “thrift” into our GPS. My husband is very tolerant. So it was a rude surprise to me that, in my process of downsizing our house to move to our catamaran, almost none of the thrift store items that I have purchased fall into the categories of “onboard requirement” or “sentimental must-have”. Mainly, someone else’s junk is just that. hand-painted tureen, made “For Gail by Lisa, Christmas 1991 – with love”. How do I know? It says so on the bottom of the serving plate. Do these things sound important to you? Me neither. Certainly, they are not the sort of thing you would stuff into a bag if you were escaping a burning building. Things I do want to preserve for storage are sentimental items like old photos, or family paintings. Other items that I’d like to keep are our snowshoes, Nalgene bottles, and thick wool socks. 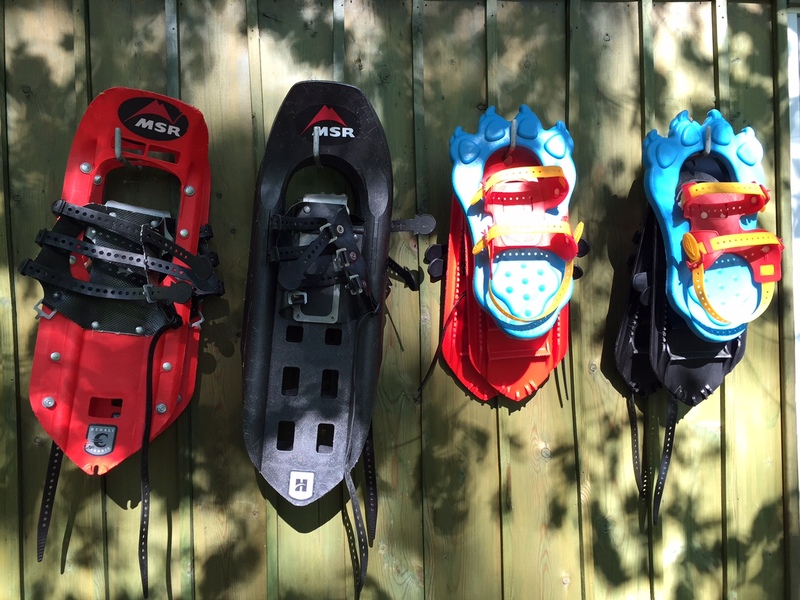 Our snowshoe collection. As Canadian as maple syrup. Why the snowshoes? Well, as you might expect, the scholarly article “Our Possessions our Selves” suggests that our possessions are heavily linked to our sense of self. This would explain why I want to hold onto my snowshoes, but I don’t want to hold onto someone else’s second-hand, dusty cast-offs. Not all of my thrift store purchases have been duds. Consider my double-wide Therm-A-Rest brand, self-inflating air mattress, that I purchased at the Three Sisters Thrift Store in Moab, Utah. In this case, the mattress is much like my snowshoes. It’s value has something to do with my self-identity and love of the outdoors. It is also a remnant of our family’s travel narrative from last summer. The success of our North American road trip was one of the reasons we began to consider a lifestyle of cruising and homeschooling our children. There’s a thrift store in Florida within steps of the marina where our St Francis 50 catamaran is moored. I’m sure that I will continue to shop at thrift stores for short-lived expendables like clothing for my kids – at least, as long as they will let me. But, definitely, I will be re-thinking what I purchase and the value that I place on future, so-called “must-have” objects.